There's a sudden glut of cycle schemes on the cards in London, and the stakes couldn't be higher. We've been monitoring how businesses and residents are rallying behind plans for central London's "Crossrail for Bikes", and yesterday we looked at top tips for campaigning for change in bike-lite outer London. Today it's the turn of my home borough, Tower Hamlets, where campaigners are having to take a different tack to muster support from their neighbouring community. When the original Cycle Superhighways were laid out in Boris Johnson's first term as Mayor, not all Cycle Superhighways were made equal. Some - like CS3 along Cable Street - were very good. 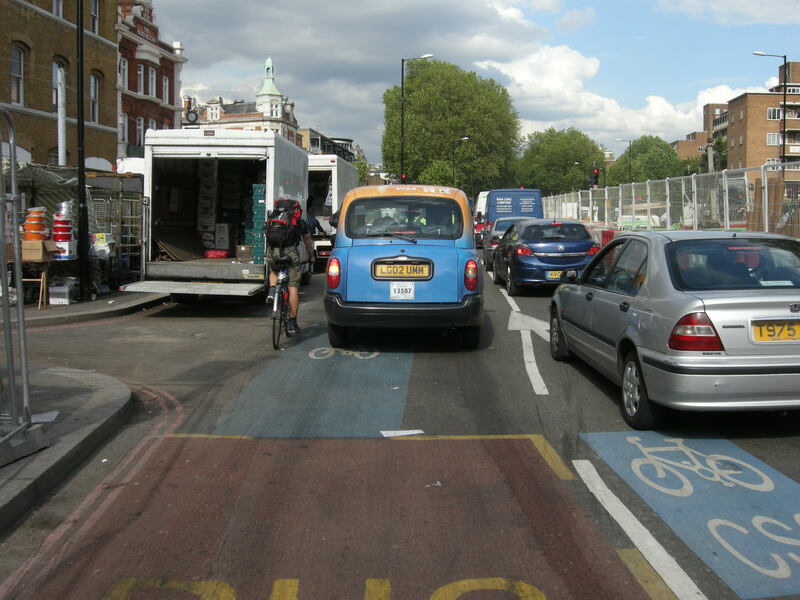 Others - like CS2 along the Whitechapel Road - were very bad. 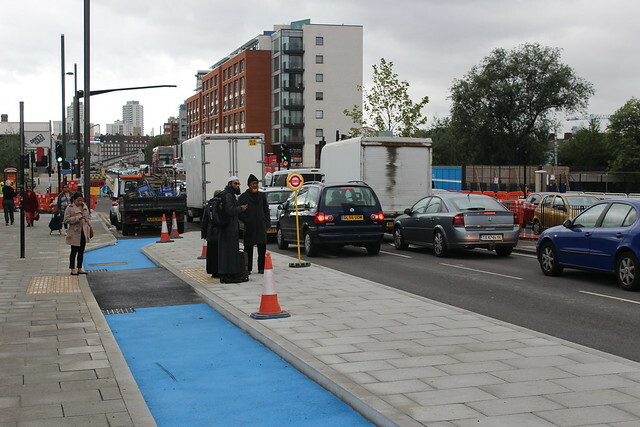 Stretching from Aldgate to Bow Roundabout it was little more than blue paint splashed across the existing narrow carriageways in most places, with no actual protection for people on bikes. The existing CS2 (it's that blue bit under the taxi, by the parked market lorry) Picture by As Easy As Riding a Bike blog, with thanks. Despite the lack of safety, cycling numbers climbed 32% after the introduction of CS2. However, a series of shocking and high profile deaths - in particular that of Philippine De Gerin-Ricard at Aldgate and Brian Dorling at Bow roundabout - led to a spate of protest rides and pushes for safety improvements. A coroner looking in to the deaths of both was particularly damning of the unprotected blue paint, with an expert witness stating that it "lulled cyclists in to a false sense of security." 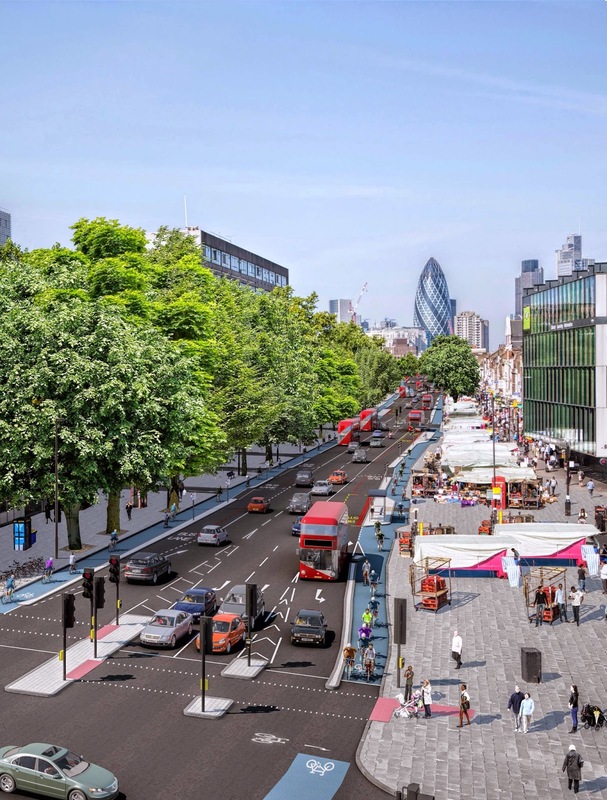 Responding to criticisms of their previous designs and keen to make the route as safe as possible, Transport for London recently published proposals to upgrade the entire CS2 route from Aldgate to Bow. At Bow Roundabout the upgrade will connect with the river Lee towpath, the Jubilee Greenway, the Olympic Park and a further stretch of separated Cycle Superhighway (CS2Ex) from Bow to Stratford which looks like this, thus creating an extensive network of connected traffic-free bike routes across the borough. Transport for London's new plans for the upgraded CS2, seen here passing Whitechapel Market towards the City. The plans will create some delays for other road users, including bus passengers, described in detail in this useful blog by East London Lines. Additionally, the new Cycle Superhighway will pass directly past Whitechapel High Street market, the power base of Tower Hamlets Mayor Lutfur Rahman and the focus of many of his supporters. Traders there are so concerned that restrictions on curb-side loading will damage their businesses that the Mayor has written in very strong terms to Boris Johnson, stating "This proposed design will place delivery vehicles outside the cycle lane, in the bus lane. It will disrupt bus services and bring cumbersome delivery movements involving heavy goods, waste, and pedestrians across the cycle lane, causing frequent obstruction to cyclists." But politics also play a part here. Rahman and the Cycling Commissioner for London Andrew Gilligan (who has spearheaded the delivery of these plans) have a long history of animosity between each other. As a Telegraph journalist Gilligan has described Rahman as "extremist linked" and has even published a 30-item long list of serious accusations against his conduct. As you can imagine, the idea that Gilligan the commissioner might now be taking out traffic lanes and pushing bike tracks through the heart of Rahman's support base is considered to be more than a little affront. A "bus stop bypass" under construction on CS2ex in Stratford in 2013. Local cycle group Tower Hamlets Wheelers, the borough branch of London Cycling Campaign, are keen to extend the olive branch to their neighbours. Fully aware of the political background to the issue, they want to re-focus attention on the fact that this scheme has been devised to increase safety on a route where 6 cyclists have been killed in recent years. And they want to show that people on bikes - of which over 2,000 a day currently pass the market by - are also good economic partners for the concerned market traders. This Saturday they'll be leading a ride from Mile End ecology park bridge to the Whitechapel market to stage a "buy in"; a positive opportunity for cyclists to exercise their purchasing power directly with the traders, to understand some of their concerns, and to show that the market and Cycle Superhighway plans can peacefully exist together. A spokesperson for Tower Hamlets Wheelers said: "Bring every possible pannier, saddlebag and basket to fill with your delicious market goodies. Together, we can show that improving cycling infrastructure can improve local business." 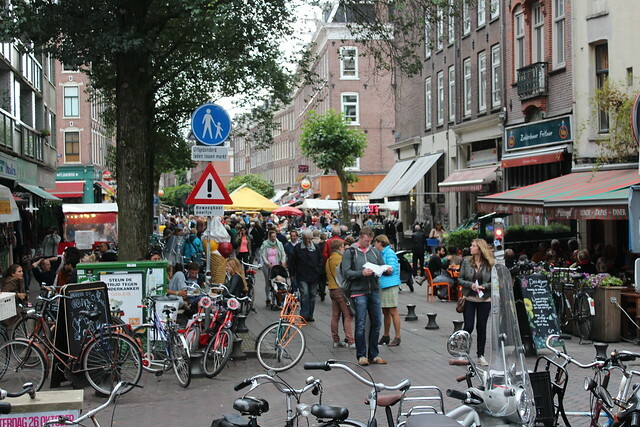 Bikes and people at the centre of economic activity - here at Amsterdam's historic market in the working class De Pijp neighbourhood. In order to earn all of the proposed changes to streets across London we are going to have to win an awful lot of hearts and minds along the way. I like the plan to hold a "buy in" to show that, because of the power in our pockets, inviting cyclists in to your neighbourhood can only be a good thing. Why not join the Wheelers for their ride this Saturday? Meet beneath the Mile End green bridge (just south of Mile End tube station) on the 25th October at 11AM before a short ride along the existing CS2 to bustling Whitechapel Market where there will be the opportunity to talk to local traders, buy fresh produce from their stalls and explore this fascinating and bustling corner of diverse London. Afterwards the ride will roll on to a tea and cake stop. Full details can be found here. Be sure to add your e-support to the plans by responding to the consultation using this easy to use form, and to say "yes" to plans to make Tower Hamlets a 20MPH borough here. You can check out the full plans for the CS2 upgrade on the TfL website here. Possibly a bit late for this weekend's Wheelers' event at Whitechapel Market, but this sounds an ideal moment to adopt 'coffeeneuring' in the UK. The idea is to leave a calling card behind at retailers where purchases have been made, bearing the message 'I arrived by bike'. It wouldn't have to be restricted to coffee shops either, but any shop or stall where a participant makes a purchase. Just need to create a nice little card design! That's a great idea! I like the idea of positive re-enforcement very much. The card is a great idea - as demonstrated in Bristol shopkeepers usually overestimate numbers arriving by car and underestimate customers on bike and foot. Will pop by on my way to the Lee Valley Revolution, and imagine that one day I could ride there entirely protected from car traffic. Nice blog. those kerbs on that bus-stop bypass under construction are not forgiving at all. No way to bail out of the lane if a pedestrian wanders in front of you. They should be low and chamfered so that you can easily escape the lane to avoid the collision. Plus them being so high narrows the lane as you have to stay away from the edges to avoid hitting them with your pedals. A stretch of protected bike path on Howland Street between Tottenham Court Road and Cleveland Street has been completed recently with the same unforgiving kerbs. Why does TfL think this is a good idea?